As more kids and parents get involved in yoga, many parents and yoga instructors are on the lookout for good yoga positions for kids. In order to be ideal for young yogis, postures should be fairly simple, and pose no danger to the child. The benefits of yoga are not just for adults, but for all yoga practitioners. Children benefit not only physically from yoga, but also mentally. Yoga helps children relax, focus, and work slowly and methodically. As a change of pace from running helter-skelter around the playground, yoga is a nice moment of calm for kids of all ages. Yoga shouldn't replace team sports and/or playground time, but yoga is certainly a good addition to a child's schedule. If you pick some fun yoga positions for kids that you can practice together as a family, everyone is likely to have a whole lot of fun in addition to reaping the physical benefits of yoga. Make your practice at a fixed moment during the week; for example, before Saturday morning cartoons, and make it a family fun time. Relax together, and have a few good laughs at the same time, as everyone is bound to have problems balancing in Tree Pose or Triangle Pose. The most fun poses for kids are ones that have animal and nature names that they can relate to. To a certain extent, fun yoga positions for kids are determined by your own kids: while a daredevil child might be interest in learning Scorpion Pose, another child might find it frightening. Throw the names out there and see what appeals to your own children. Tree Pose, pictured at the top of this page, is a great pose for kids, as long as they have a good attitude about trying to keep their balance. If trying to balance in this pose is a source of frustration instead of a good challenge, move on to the next pose. Have your child think of a cat stretching its back and then help your child get into Cat Pose. If possible, do it in front of a mirror so that he or she can look into the mirror and observe why it's called Cat Pose. The same applies for Downward Facing Dog Pose: use a mirror when showing it, and if possible, point out a dog doing the stretch the next time you get a chance. Teaching young children about geometrical shapes through yoga can be educational and fun. 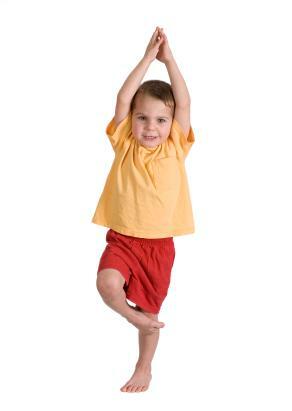 Try Triangle, and Side Triangle as well; have your child trace the triangle while you demonstrate the pose. The name of Cobra Pose will really appeal to some children and scare other children. Just ask them what they think of the animal, and if they say something positive, show them there is a yoga pose called cobra. While Fish Pose may not be as obvious a name as some of the other animal-name yoga poses, fish are usually loved by most children, making this a fun pose for kids. If you and your kids are having fun with yoga, consider purchasing the Kids' Yoga Deck, a deck of 50 cards with yoga poses likely to be loved by kids. There are several other DVDs, books, and games available for kids practicing yoga. In addition, a yoga teacher in your area may teach special yoga classes for children where poses are chosen especially with kids in mind and the teacher is specifically trained to help children practice yoga safely while having fun at the same time. Read this LoveToKnow Yoga interview with kids' yoga instructor Mary Kaye Chryssicas to learn more. .